The Abyss power is once again vacant, so the time has come to get your hands on the throne and its privileges. Use all of your cunning to win or buy votes in the Council. Recruit the most influential Lords and abuse their powers to take control of the most strategic territories. Finally, impose yourself as the only one able to rule the Abyssal people! Abyss is a game of development, combination and collection in which players try to take control of strategic locations in an underwater city. To achieve this, players must develop on three levels: first by collecting allies, then using them to recruit Lords of the Abyss, who will then grant access to different parts of the city. 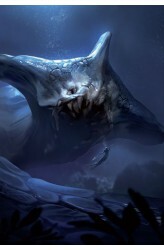 Players acquire cards through a draft of sorts, and the Lords of the Abyss acquired on those cards grant spe.. Smugglers Guild settled in the heart of the giant sea creatures cemetery, in the darkest depths of the Deep kingdom. In this disconcerting necropolis, with the help of mysterious Krakkens, representatives of Guilds are trading NEBULISES. Nebulises, wonderful black pearls, are the unofficial currency of the realm. That's money stained with blood. They accelerate your way to power, but be careful, because those who are caught on their possession awaits a terrible fate! 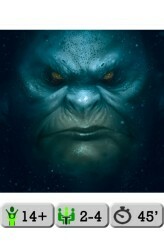 Abyss: Kraken is the first expansion for Abyss. When playing with the Kraken expansion, base game rules doesn't change, although new elements are added: New Allies Nebulises New Lords New Locations ..
News from the outpost is worrying. The Leviathans, these terrifying sea monsters, are converging towards the border and threatening the Kingdom. Will the Allies and the conscripts, mandated by each of the Guilds, contain them? Exploring is now dangerous: fighting is not easy, and fleeing can be even more dangerous — but the opportunity is unique to prove your worth and use this influence to gain access to the throne. 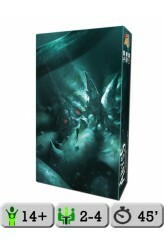 In Abyss: Leviathan, the threat track is replaced by the border board on which Leviathan cards will be placed. When you explore the depths, if the revealed card is a monster, you can fight a Leviathan on the border. Some new lords and some allies will help you fight, using their power. The player who has killed the greatest number of sea monsters takes the st..
All you need in Décrocher la Lune are a few skillfully placed ladders, a good sense of balance, and a touch of imagination. 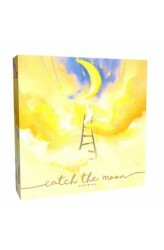 The moon waits impatiently for your arrival, but she's a sensitive lady and the smallest mistake can make her cry. The right mix of skill and luck will help you become the most agile dreamer... .. It's that special time of year when the entire kingdom gathers at court for the Munificent Theatrical Festival. Acting troupes from all over the land will come together to perform plays of light-hearted comedy or soul-wrenching tragedy. Will their performance win the favour of the king or will his fickle mood spell a flop? In Histrio, you travel the land recruiting actors to join your troupe. Assemble the right team and you might earn enough money to pay for an entire year of shows. It'll take careful planning and a little luck to out-perform your competitors. 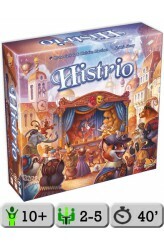 The play is the thing in Histrio, and the world is your stage! 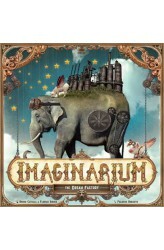 https://www.youtube.com/watch?v=bDp_g0BU-yU ..
Imaginarium is a strategy, combination and development game. Details to come. https://youtu.be/NhBLD7ls9-s ..